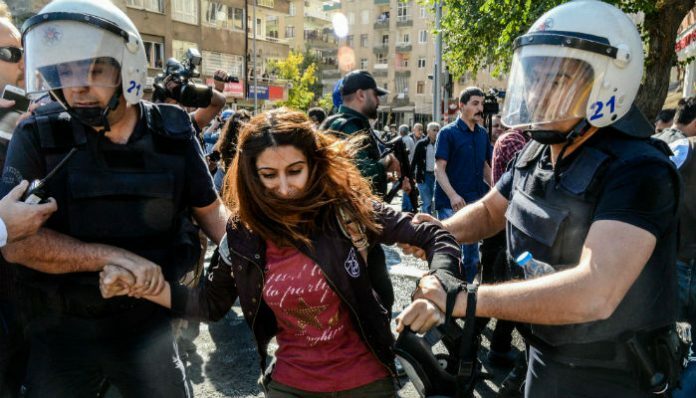 Police teams have intervened in a crowd that gathered in front of the Diyarbakır municipal building to protest the detention of the city’s co-mayors on Tuesday, detaining 25 people. Diyarbakır Co-mayors Gülten Kışanak and Fırat Anlı were detained on terrorism charges on Tuesday evening in a development that caused outrage and sparked protests in the region. When demonstrators including Peoples’ Democratic Party (HDP) Co-chair Figen Yüksekdağ began to gather in front of the municipal building in the early hours of Wednesday, police teams used pressurized water to disperse them. Twenty-five protestors were detained. In the meantime 15 nongovernmental organizations in the region released a written statement on Wednesday in which they expressed concern about the detention of the Diyarbakır co-mayors. “Such a development narrows the democratic, civilian spheres of politics and undermines the belief in civilian politics. It is likely to aggravate the problems we have been experiencing,” said the statement. Media reports said on Wednesday that Kışanak and Anlı will not be able to see their lawyers for five days. A state of emergency declared in Turkey in the aftermath of a failed coup attempt on July 15 has increased the detention period to as many as 30 days, andnormal procedures are not followed in detainees’ access to their lawyers. Kışanak was detained at Diyarbakır Airport upon her return from Ankara, where she testified to Turkey’s parliamentary Coup Investigation Commission on Tuesday. Anlı was detained at his home. Kışanak and Anlı are accused of giving speeches in support of the outlawed Kurdistan Workers’ Party (PKK) and of promoting more autonomy for Turkey’s Kurds, according to a statement from the Diyarbakir Prosecutor’s Office. They are also accused of transporting the bodies of dead militants in official cars and of sparking violent protests. The HDP reacted adversely to the detention of Kışanak and Anlı. “We condemn the detention of Diyarbakır co-mayors Gülten Kışanak and Fırat Anlı. We call for their immediate release. Our people will not accept this and will exercise our democratic right to protest,” said a Twitter message from the HDP. The Turkish government has been expanding operations against the PKK to HDP and Democratic Regions Party (DBP) members and to municipalities run by those parties. This article originally appeared in Turkish Minute on October 26.